In 1971, Ireland decimalised its currency in parallel with the UK. We did this because we were tied to the UK Pound at that time and one of the more unusual aspects of decimalisation was that both countries adopted a ‘non-decimal’ fraction of the basic unit (100 new pence = one pound), i.e. a decimal halfpenny (something of an oxymoron). 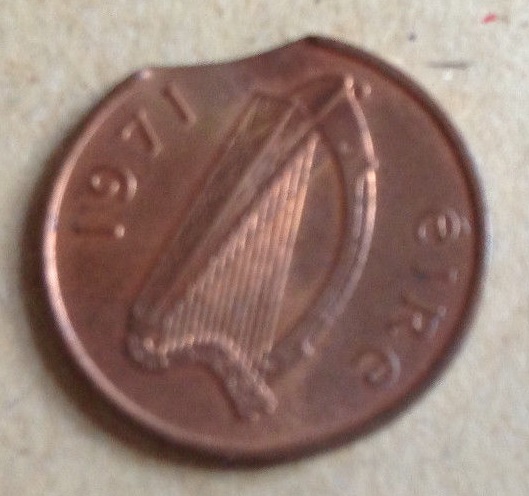 Ireland decimal halfpenny 1971-1985 – designed by Gabriel Hayes (1909–1978) – an Irish artist born in Dublin. She was a sculptor who studied in Dublin, France, and Italy. She also designed the penny and twopence coins of this series. The ‘ornamental bird’ design was inspired by The Book of Kells – a famous Early Christian illuminated manuscript kept in Trinity College Dublin. With soaring oil prices, inflation rapidly and within 15 years, the decimal halfpenny was withdrawn. The last Irish decimal halfpenny is difficult to obtain due to the fact that it was only issued as part of a Brilliant Uncirculated (BU) year set. Only 6,750 of these sets were issued. Although there were 2.8 million halfpennies minted in 1985, this coin is particularly scare in the higher grades as the vast majority of them were melted in 1987 (after the coin was withdrawn from circulation). They are still legal tender but can be exchanged at the Central Bank of Ireland in Dame Street, Dublin. Alternatively, you might try selling them to a coin dealer they usually pay more than the Central Bank for such coins. There are several errors worth collecting – the most common being a ‘clipped’ planchet.